Shelley Made: One..Two..Three Peasant Dresses! 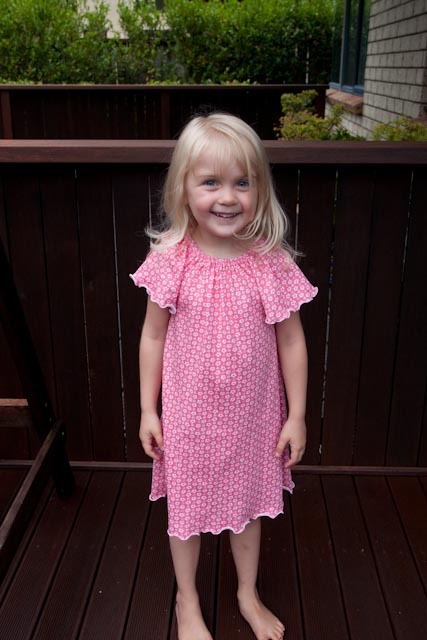 My 4 year old is VERY into dresses at the moment. So with the hot summer weather I thought she could so with a couple of nighties to sleep in. Knit was my preference - for comfort more than anything. I have the Ruffled Lilly pattern from Ginger Louise. 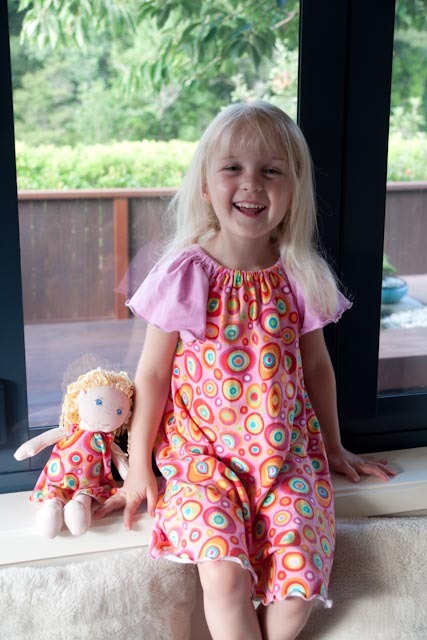 It comes in both 12m-4 and a 4-8yr sizes, and is downloadable. It isn't specifically written for knit - but I made a few modifications and think it's turned out well. It specifies elastic around both the neck and arms - I skipped the arms - thought it would be more comfortable with a rolled hem. I did lettuce edging (the ripply rolled hem) on both the dress hem and sleeves. I took about 3 inches out of the centre of the sleeve as I thought it would be too full without the elastic casing. I self drafted a sleeveless peasant top for the doll. My daughter was DELIGHTED! 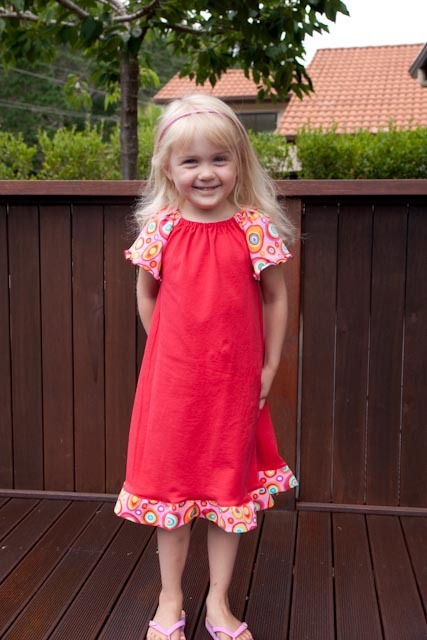 Plus - because she loved them so much, and wanted to wear them all day - we made another one for kindy/pre-school. This one has a two inch ruffle I added to the bottom... I thought it looked less nightie-ish! It did make it longer of course, but she insisted I didn't shorten it. They are really simple, really quick to whip up - and super comfortable. It's all she has been wearing (given a chance!) since I made them. Oh...thanks--i dont know what is cuter the dresses or your beautiful daughter!!! !